On the 3rd of November 2011 I observed Cambridge’s West/Central area committee approve planning permission for a takeway on King Street. The approval, by the committee made up of all Liberal Democrats along with independent Cllr Hipkin, was in contravention of the council’s policy on the provision of cycle parking. Cllr Bick was the only committee member to vote against. The council’s policy is that food retail premises must provide one cycle parking space per 25m2. gross floor area up to 1,500m2 and thereafter 1 per 75m2. 60 King Street is 100m2 so a minimum of four cycle parking spaces ought to have been provided. The premises does not have any car or cycle parking associated with it and the applicant does not propose to provide any due to the constrained nature of the site. Despite this, for customers visiting to stay and use the restaurant I am satisfied that the very central location of this site in the City Centre offsets this shortfall. The good provision for secure cycle parking, really accessible public transport and car parking available in nearby designated car parks all within this central location overcomes the lack of provision made by the site. Councillors noted that the Cambridge Cycling Campaign had made a suggestion of how provision of cycle parking could be obtained by taking a car parking space sized piece out of the roadway and putting cycle racks outside the property. The proposal was that this could be paid for by a s106 tax charged as a condition of the award of planning permission. I think this was a fantastic idea. It’s exactly the kind of situation I think s106 taxation is intended for, and one where I support its use, to enable a planning applicant to pay for alterations to the local public infrastructure in order to solve a problem which would otherwise prevent planning permission being granted. I think the proposal, well designed, could add to road safety – the width of the pavement outside the premises could be widened as part of the scheme, giving more space for people to spill out on to and to congregate while reading the menu or waiting to be seated. I think there would also have been some traffic calming impact as well. Many councillors thought it was a great idea too. Council leader Liberal Democrat Sian Reid spoke strongly in favour of it, as did a number of others. A turning point came though when councillors asked their planning officer for advice on what exactly they ought to do. It appeared the planning officer was unprepared and he said that as the proposal was outside the control of the applicants – as they couldn’t just go and install the cycle parking on the highway – councillors couldn’t make that part of a condition. This is total nonsense, and a couple of councillors, including council leader Sian Reid pointed this out. Cllr Reid said that planning permission for new developments had been made conditional on improvements to roads which were not in the control of the developers (eg. Northstowe’s planning is conditional on an A14 upgrade). A councillor slightly muddied the debate by raising the area (corridor) transport plans the planning officer said that there was no s106 liability generally incurred with the a change of use of the type being sought. I suspect he might well be right, but that is a general contribution to the area plan, and not a site specific local mitigation. It appeared that the planning officer was out of his depth, and ill-prepared for responding to the proposal (he called himself a “principle planning officer” though). I think it was his lack of knowledge and his advice to councillors that they couldn’t do what they wanted which made councillors drop the proposal. So in typical Liberal Democrat style, after having praised the Cycling Campaign, and having spoken strongly in favour of their fantastic idea, Cllr Reid and her colleagues then failed to act on what they had said. In terms of effective lobbying and campaigning here one problem might have been that as far as I can see the Cycling Campaign suggestion wasn’t submitted as a formal planning representation. At least I can’t see it on the council’s planning public access page for the application. I understand it may have been raised in relation to a previous application, but not resubmitted for this one. The fault here isn’t really with the campaigners though, I think the council should carry relevant comments (suggestions/objections/notes of support) forward when a series of similar applications are made; this would prevent people from having to repeat the same objections multiple times when dealing with repeat applications. In this case such a practice would perhaps have ensured the planning officer was better prepared to deal with the suggestion. Another thing to consider is how would the application have been dealt with if there had been dedicated cycling officers within the council who would have been charged with looking hard to see how the cycle parking policy could have been complied with. It doesn’t appear if as was promised all planning officers are up to speed with cycling related matters so as to render the specialists no-longer required. At the Cambridge Cycling Campaign AGM on Tuesday the 1st of November 2011 the annual report on the campaign’s activities questioned if Cambridge City Council deserved to be called pro-cycling given its failings to adhere to its own cycle parking policy. Local residents expressed concern about cars parking outside, people sitting in cars on the streets eating takeaway food, noise, and smells. Councillors, other than Cllr Bick, largely dismissed these concerns on the basis these problems were already occurring due to nearby food premises. One of the most shocking aspects of the discussion came when the planning officer stated that the rooms above the proposed restaurant were occupied by Christ’s College students. Councillors were already discussing the impact on local residents, but a number of councillors appeared to think that University of Cambridge students needed, and deserved, more peace and quiet and less disturbance from the operation of the business than other near by residents did. I was astounded by this apparant double standard. The applicant and his father both addressed the committee. They said they were planning to run the restaurant mainly as a restaurant and the takeaway service would only be ancillary to that. They gave the example of restaurant diners wanting to take a meal home to a relative. I was surprised by this, thinking it was a rouse by the applicants to persuade councillors to let them run a takeaway, but a the applicant and a number of councillors suggested this was normal and common in restaurants such as that being proposed. The planning permission was granted with a condition limiting the takeway use to being ancillary to the restaurant. I thought councillors were a bit vague, I’m not clear if, for example an individual will be able to walk in and just order a takeaway meal, or if takeaway food will only be sold to those who are already eating in. Sir, while you are waiting you must sit down and eat a poppadom, it’s a condition set down by the city council and we can’t let you take your curry out the door if you do not comply. Maybe planning officers will bring some sanity to the situation when they interpret the councillors intent and formalise it in the actual planning condition. Local residents requested a condition on opening hours. One was imposed restricting opening to between 08:00 and 23:00. The planning report from February 2011 when permission was given for use as a Restaurant/Cafe or Drinking Establishment, but not a takeaway, didn’t mention cycle parking at all, so perhaps things are very very slowly improving. 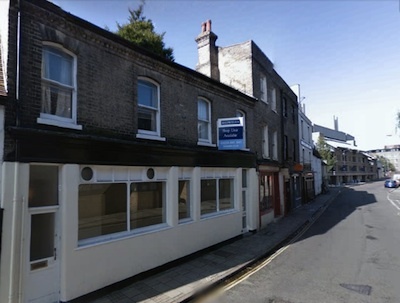 New Indian restaurant set to open in King Street – Cambridge First Article on the proposed “Amin Indian Cuisine” restaurant. Later in the same meeting councillors approved the installation of six cycle parking spaces at public expense just off King Street. The officer really doesn’t understand how people in Cambridge use their bikes if he thinks people are going to park in Park St. car park and walk to an Indian Restaurant on King Street. People like to, and will, park their bikes pretty much right outside where they’re going. Your case report includes a heading: “Car and cycle parking” as a main issue. But inexplicably, there is then no discussion of car or cycle parking in the following paragraphs. We are concerned that there is zero cycle parking provided for this development, which is obviously of a kind that generates customers arriving by bicycle. The area is extremely short of cycle parking, though there is space directly in front of the store. Could you kindly clarify why seemingly no consideration was given in the report to the provision of cycle parking? Thank you for your email. I apologise for the delayed response. This was an application for minor alterations to the shopfront, advertisements, provision of an ATM and the relocation of plant equipment. It was not an application for change of use of the premises. I have checked the application history and I agree the section on cycle parking is indeed missing from my officer report. This is an error for which I can only apologise. When considering such applications in busy city centre locations, the space for on site cycle parking is often limited. In addition, there needs to be a balance between cycle parking provision and minimising street clutter in the interests of accessibility considerations for the blind and partially sighted.